Windy with periods of rain early. Breaks of sun in the afternoon. High 72F. Winds N at 20 to 30 mph. Chance of rain 70%..
“President Carter: The White House Years” by Stuart E. Eizenstat, Thomas Dunne Books, 999 pages, $40. Books may be compared to meals. Some are savored, leaving a lingering pleasant sensation on the palate. Others may be bland and difficult to digest but should be finished because they are nourishing. Stuart Eizenstat’s “President Carter” falls into the latter category. Few Americans remember the term of our 39th chief executive fondly. Double-digit inflation, soaring interest rates, long lines at the gas pumps, chaos in the Middle East and anxiety about global nuclear confrontation characterized 1976-1980, the years of Jimmy Carter’s presidency. 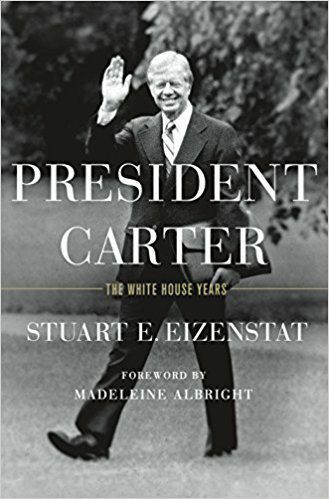 Eizenstat was a respected member of both the Carter and Clinton administrations, and his book gives an honest assessment of the difficulties and achievements which occurred during Carter’s four years. As a dedicated policy wonk, the author goes into excruciating detail, which tends to make the book’s pace agonizingly slow. Indeed, this book would be an excellent choice to while away the hours one may spend in the waiting room of Purgatory. Readers desiring a candid appraisal of Jimmy Carter’s strengths and faults will find them both on display here. His tenacity in pursuing worthwhile goals and his total adherence to his rural, Southern Baptist background allowed Carter to make lasting contributions to America’s energy, human rights and environmental future. Conversely, these characteristics also made him a politician unacceptable to the D.C. establishment and to an electorate resentful of his perceived preaching. Eizenstat’s sober analysis and impressive documentation give a clear picture of the convoluted course and need for compromise necessary to pass any significant legislation. He also clearly delineates the unforeseen external problems such as the downturn in global economy and unpredictability of Iran’s theocracy, which would have made re-election difficult for even the most charismatic of politicians. Carter, who won the Nobel Peace Prize in 2004, is one of the rare presidents whose reputation has improved since leaving office. This book should certainly prepare readers for another state funeral celebrating the accomplishments of a one term president who followed his own moral compass while guiding our country. J. Kemper Campbell M.D. is a retired Lincoln ophthalmologist who has now managed to last through 13 presidencies.